The axiom “out of sight, out of mind” applies as much aboard boats as anywhere else, and it is especially relevant to marine electrical and electronic systems. Because flaws, faults, and defects are not readily apparent in these systems, they tend to go unnoticed. However, when you know where and how to look, problems—and their solutions—often become quite obvious. A good place to start is by examining the cables that connect some of your onboard electronics. and shortwave radios; AIS; GPS; and cell phones and cell boosters. The name “coaxial” stems from the fact that the cable’s inner and outer conductors share the same geometric axis. The inner core, which is typically a series of coarse strands but also may be a single conductor, carries the signal. A grounded, tube-like outer conductor— also called a shield and consisting of a braid, a foil, or a combination of the two—reduces loss or degradation of the signal while minimizing electromagnetic interference from other radio signals or electrical equipment. The greater the coverage of the shield, the better; coverage often is expressed as a percentage between 65 and 95. Virtually every home in the United States (except mine; by choice, I have no outside TV reception) and in Canada, Europe, and elsewhere in the developed world utilizes coaxial cable to connect external antennas, satellite dishes, or cable TV to television sets. Coaxial cable also is widely used for highspeed Internet connections. If an ordinary wire, rather than a coaxial cable, is used for the transmission of radio frequency (RF) energy aboard your boat, it will simply act like an antenna. It will transmit signals inside your boat, which can cause interference and malfunctioning of other equipment, but it will lose those signals as they travel to and from the radio and antenna. In a coaxial cable, the shield is grounded at the transmitter/receiver end, thereby keeping the signal contained within the cable and preventing the introduction of unwanted signals into the center core conductor. The spacing between the shield and the center core is critical and must be kept constant; a dielectric insulator located between the core and the shield achieves this. Kinking, crushing, or sharply bending a coaxial cable compromises this spacing and will degrade the signal. (For this reason, most coaxial cable manufacturers specify a minimum bend radius.) Stripping away the dielectric insulator and terminating or splicing the core and shield “manually,” as you would with ordinary wire, also leads to signal loss and increases the likelihood of interference both to and from the cable. Additionally, any abrupt change to the dimensions or spacing of the core and shield will cause a reflection of radio waves back to the source, the transmitter. These “standing waves” create a bottleneck through which signals have difficulty passing and ultimately degrade the transmission quality. Standing waves are measured as a ratio (the standing wave ratio, or SWR) that essentially expresses the difference between the maximum RF voltage and the minimum RF voltage along the cable. What’s most important about this ratio is ensuring that it’s kept low. If there are no reflecting sources and if the cable is uniform and properly terminated, then, ideally, the SWR would be 1:1. Another factor that affects the SWR is the matching of the impedance (or resistance) of the cable—which is a function of the cable’s dimensions and construction—to the impedance of the devices to which it’s connected: the antenna and the receiver or transceiver (a transceiver is simply a combined receiver and transmitter). When the two values are matched, they appear “transparent” to the RF signal and reflections, and thus the SWR is minimized. Most coaxial cables used for radio transmission and reception aboard boats have an impedance of 50 ohms; others, such as those used for televisions, have an impedance of 75 ohms. It’s important that cable with the correct impedance be used and that it match the antenna and transceiver/receiver to ensure a low SWR. A variety of coaxial cables are available from many different manufacturers in a host of sizes, with a wide range of loss characteristics, impedance values, quality, and prices. Selection can be truly confusing, even for professionals. Proper cable selection depends primarily on a few details. Chief among these are the recommendations of the equipment manufacturer. In many cases, the maker of a radio will very clearly spell out the type of cable that should be used, depending on the installation conditions. In the absence of that information, additional criteria must be relied upon. Begin by determining the frequency range of the equipment. This isn’t as difficult as it sounds. In general, the most commonly used radio equipment falls into a few well-defined frequency ranges. HF, SSB, and shortwave radios rely on conventional coaxial cable and operate between 3 and 30MHz (megahertz). Marine VHF radio and AIS frequency is between 156 and 158MHz, and cellular frequencies are between about 850 and 1900MHz. GPS satellites and receivers operate at about 1500MHz. Wi-fi tops the list at 2.5–5GHz (gigahertz). The reason frequency is important where cable selection is concerned is that it relates to the attendant inefficiency or signal loss: the higher the frequency, the greater the potential for signal loss from the cable. Several protocols can be derived from this truism. Gear that operates at higher frequency must use higher-efficiency, lower-loss cable (and connectors; more on those below), and the runs between the receiver/transceiver and the antenna should be kept as short as possible. Sometimes the latter is impossible, necessitating the use of even lower-loss cable. Of course, short cable runs and low-loss cable are desirable for all radio equipment, but these factors become even more critical for VHF, AIS, and cellular/wi-fi equipment. Although a cable’s loss characteristics are not as crucial when it comes to SSB, HF, and shortwave, these installations still can suffer—and regularly do—from poor cable selection, unnecessarily long runs, or a combination of the two. As an illustration of how coaxial cable loss can affect transmission characteristics, I’ll share a scenario I frequently encounter aboard vessels I inspect: A VHF radio is installed in the pilothouse aboard a 52-footer. 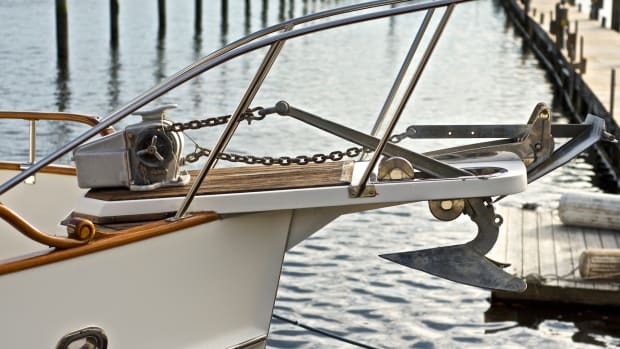 The cable run from the radio to the antenna, which is mounted on an arch or mast above the flybridge, is 40 feet (that’s assuming the installer hasn’t left an additional 20 feet of cable coiled up beneath the helm, which is highly undesirable but not uncommon). The cable run is a measure of actual linear feet, rather than an imaginary straight line drawn between the antenna and transceiver. The output of the VHF radio is 25 watts (or 1 watt on specified channels). The cable that’s been chosen is a common type referred to as “RG-58/U” and is about 0.2 inch in diameter—pretty narrow. The end result is that the actual power output at the antenna end of the cable is just 13.4 watts. That’s a reduction of 45 percent; the rest of the power has been “lost” in the cable run. It’s important to remember that the type and location of the antenna have a considerable effect on the efficiency of the transmitted signal. However, in plain terms, the lower a cable’s loss, the more power the antenna will receive, and the greater its transmission (and reception) characteristics. Let’s say that, instead, a more efficient cable is chosen, such as RG-8X, a 0.245-inch-diameter, higher-efficiency, lower-loss cable that is commonly used for VHF installations. With all other factors remaining the same, the wattage reaching the antenna increases to 16.9, or a reduction of 32 percent. If a still lower-loss cable is used, such as the hefty 0.4-inch-diameter Times Microwave LMR-400 (www.timesmicrowave.com)—the Cadillac of coaxial cables and my personal preference—the reduction in radio energy reaching the antenna is a scant 12 percent. Now, imagine similar circumstances applied to a cellular antenna installation. Recall that cell frequencies are many times higher—and thus loss potential is many times greater—compared with VHF installations. In addition, cell output varies between about 0.25 and 3 watts (the latter for boosters), which is much lower than a VHF radio’s output. It’s easy to see how performance can be significantly degraded. The price paid for achieving low loss—cable bulkiness and commensurate expense—is clear indeed. The same calculations can be carried out for other cables and transmission frequencies, with startling results. In the above example, we see how the high frequency of cell phones, coupled with their low output power, makes for very exacting coaxial cable requirements: low-loss cable should always be used, and every effort should be made to keep all cable runs as short as possible. The same holds true for wi-fi applications. By the same token, even though SSB frequencies are lower and thus less loss prone to signal loss, runs between the transceiver and the antenna and/or tuner often are long, which means that these installations call for low-loss cable. Additionally, in spite of the fact that an SSB radio’s output power is considerably higher (150 watts), the range over which it transmits—hundreds or thousands of miles—is considerable. As such, it’s worth the effort and expense of ensuring that the antenna receives as many watts of transmission power as possible. Using RG-8X cable for a 50-foot run between a helm-mounted SSB transceiver and a lazarette-mounted tuner would result in an 18 percent power loss, assuming other inefficiency factors are the same as in the previous examples. Eighteen percent might not seem like a significant number, but when one considers the transmission distance, it could mean the difference between a voice communication that’s intelligibly received and one that’s ignored because it’s garbled, faint, or static laden. If Times Microwave LMR-400 cable is used, the signal loss becomes just 7 percent. Every watt counts when it comes to marine communications, so don’t let an installer convince you that any cable will work fine; insist on low-loss cable. Another note on SSBs: Most utilize a separate antenna tuner that should be located close to the antenna. The tuner is connected to the transceiver using coaxial cable, while the connection between the tuner and the antenna utilizes a specialized, non-shielded cable referred to as GTO-15. Although coaxial cable resembles GTO cable, the two should not be confused or substituted for one another. When choosing coaxial cable, in addition to heeding the criteria mentioned above, you must ensure that it is suitable for marine applications. Fortunately, labeling coaxial cable “marine grade” isn’t simply a way for manufacturers and retailers to charge more for a product that’s no different than land-based versions. Most marine-grade cable utilizes corrosion-resistant tinned conductors. The cable’s jacket may be white or black, although proprietary marine coaxial tends to be white. The name of the manufacturer, as well as the cable type—RG-8X or LMR-400, for instance—should be printed clearly on the jacket. The other half of the coaxial cable equation involves the method of attachment. Coaxial cables require special terminals that must be installed following clearly defined techniques, the transgression of which nearly always results in diminished performance or, worse, no performance at all. The number of available connectors is nearly endless, and the quality of construction and materials used covers a broad spectrum—from economy to gold plated. Connectors should be purchased from respected, name-brand manufacturers; often, higher quality connectors are embossed with the manufacturer’s name. Brands to look for include Amphenol (the company that invented modern coaxial connectors), Ancor, Shakespeare, and Times Microwave. High quality coaxial connectors are made of brass or beryllium copper with silver and/or tin plating or, in some cases, gold plating. (The conductivity of silver is higher than that of gold and even copper; however, gold does not tarnish—although silver’s silver oxide “tarnish” is conductive.) In connectors that are designed to be soldered, the insulating material between the center core and the outer shield should be capable of withstanding heat of at least 300°F. 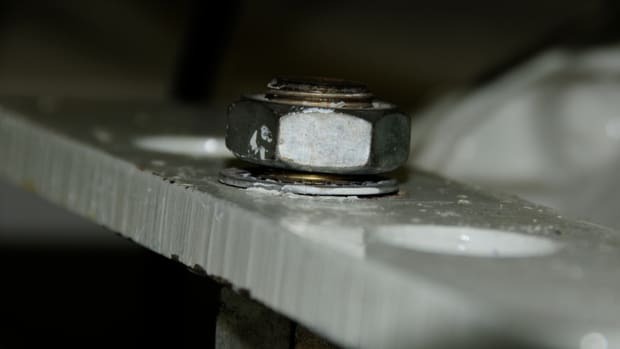 Lower-quality, low-cost connectors often utilize a form of plastic whose melting temperature is well below this threshold, making it difficult to achieve a solid solder joint without damaging this insulating material. Always check a connector’s specifications before purchasing it. Much like coaxial cable, connectors are available in many styles and varieties. The key difference between them is the frequencies for which they are rated. The most common connector, known as UHF style, has been around for many years, having been invented by an Amphenol engineer in the 1930s. Because the impedance of a UHF connector is variable, it is only suitable for frequencies up to about 300MHz, which includes HF, SSB, shortwave, and VHF. The most popular designations for UHF connectors are PL-259 (the male portion) and SO-239, the female component, which typically is located on the equipment and, in some cases, on the antenna. Any equipment operating above 300MHz, including cell phones, GPS, and wi-fi, requires a more sophisticated type of connector. These lower-loss units include such varieties as Type N, BNC, TNC, and Mini, all of which are usually available in most cable sizes. The primary difference between UHF connectors and these other connectors is that the latter maintain constant impedance. This makes them suitable for frequencies above 300MHz, because they keep SWR and RF transmission efficiency at an acceptable level. At one time, the only way to professionally install a coaxial connector for anything other than TV applications was by using solder. Soldering remains an excellent approach; however, many quality connector manufacturers now offer reliable solder-less coaxial connectors. In some cases, special crimping tools or dies are required; in other cases, all that’s needed is needle-nose pliers. Personally, I prefer a properly soldered coaxial connector, but that’s primarily because I spent years perfecting my coaxial connector soldering technique, and I can’t bear to let those skills go to waste. Whichever approach you use, be certain you understand how the termination is to be made. If a single hair-like strand of a coaxial cable’s shield is out of place, it can create a short, which in turn will cause the associated equipment to malfunction. Most coaxial connector manufacturers offer detailed instructions explaining how to install their products. 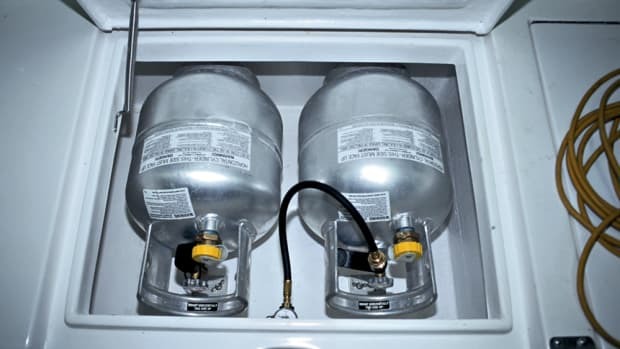 Take the time to familiarize yourself with the installation procedure. Although not terribly difficult, it usually is a specific, multistep process. When coaxial cables are initially terminated, they should be checked for both continuity and short circuits. After installing connectors at each end and before connecting the cable to the antenna and transceiver or receiver, test for continuity between the shield and the core conductor by using an ohmmeter. The resistance should be infinite—that is, there should be no connection whatsoever between the two. Any connection, regardless of how high the resistance, is too much; it’s a short circuit that will degrade performance or prevent the attached equipment from operating altogether. Next, use a jumper wire to connect the shield and the core at one end of the cable (make the connection between the center pin and outer body of the connector). Measure the resistance of the connection at the cable’s opposite end. This will confirm that the connectors are properly installed and are making good, low-resistance bonds with the cable. The reading should be exceptionally low: no more than 1 or 2 ohms, most of which is a result of resistance induced by the terminal-to-cable interface. 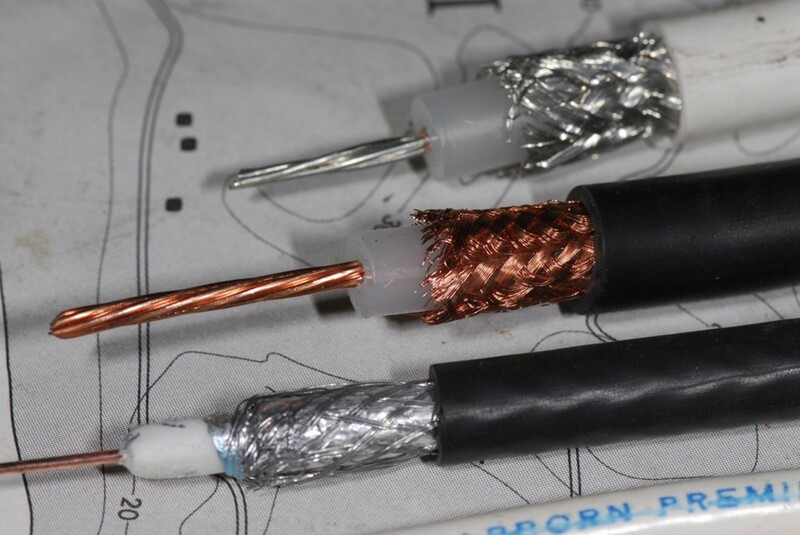 High quality coaxial cable alone, without connectors, possesses roughly 1.5 ohms of resistance per 1,000 feet. Few coaxial connectors are designed to be waterproof or even water resistant. Therefore, in installations on weather decks, appropriate measures must be taken to prevent water entry into cables. Because the shield used in most coaxial cables consists of a very fine wire braid, it tends to absorb water via capillary action. Even when it’s not directly exposed to free water, heavy fog or chronic high humidity can induce water entry if the shield is exposed. Once this happens, the cable’s performance is almost immediately degraded. 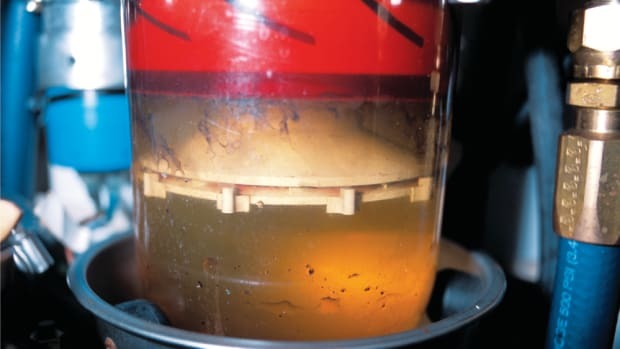 Before assembling a coaxial connection on a weather deck, apply dielectric grease to the core pin and to the threaded or bayonet connection. Then, remove all traces of grease from the outside of the connector and sheath it in heat-shrink tubing or weatherproof electrical tape. If using tape, be sure to start the tape wrap low and work upward to the attaching end of the connector to create a water-shedding shingle effect in the overlapping wraps. And, if possible, include a drip loop—a low U-bend in the cable where accumulated water will drip off—so the cable will not act like a flume and channel a stream of water toward the connection. Because the type of coaxial cable used is so important to the success of the installation and because cable selection depends partly on the length of the cable run, antennas that are manufactured using en bloc female coaxial terminals, rather than “pigtail” coaxial cables, are preferred. When the antenna manufacturer includes cable as an integral part of the product, oftentimes the user is stuck with a cable that isn’t long enough, requiring a splice. Additionally, if the cable is ever cut, crushed, or damaged or if it becomes waterlogged, the entire antenna may have to be discarded. It’s also possible that one may wish to utilize a higher quality cable than the one supplied by the antenna manufacturer, especially if a long run is involved. Another drawback: antennas that include a permanent pigtail preclude ohmmeter testing of cable assemblies. When given a choice between the same style of antenna with a pigtail or a female coaxial connector, choose the latter so you can use the cable of your choice and so that cable assemblies can be tested. Once all connections have been made, you should test your equipment. For radios, that means making checks from the greatest possible distance. Any VHF radio check from a vessel less than 10 miles away is of limited value. Do not place a call to the Coast Guard; they have more important things to do, and their transmitters and antennas are uber-powerful, so it’s likely you could make contact using little more than a wet mooring line as an antenna. (I once made contact with a Coast Guard facility in Portsmouth, Virginia, while halfway to Bermuda, roughly 250 miles offshore.) Checking VHF operation by tuning in the weather channel also counts for naught when testing a new installation. Instead, place test calls to several other boats that are more than 10 miles away. SSB radio checks should be performed both day and night, with successful nighttime radio checks occurring with stations more than 1,000 miles distant. Using an SWR meter on VHF and SSB installations is an ideal way to check that coaxial cable (and, on an SSB, the antenna counterpoise) has been properly installed. With cell phones, coaxial cable and antenna checks are somewhat more challenging. You can, of course, compare the number of available “bars” with and without the external antenna. Clearly, if the external antenna affords you no additional bars, something is wrong. Testing coaxial cable installations for AIS and GPS transceivers/receivers can be somewhat more challenging. At the very least, the signal-to-noise ratio should be assessed, and the operation of this equipment should be carefully scrutinized and compared to that of other receivers on nearby vessels when possible. If it appears that something isn’t right or if signals are inexplicably marginal or nonexistent, don’t ignore the problem. Find the source or seek professional assistance before relying on this gear. Because signal loss is difficult to quantify unless it’s actually measured or the applicable calculations are performed, the user often has no idea just how bad it is. When I query boatbuilders or electronics installers about the cable that’s being used in a particular installation—its loss characteristics, length, and so forth—the response is almost invariably, “It’s fine. That’s what we always use.” In many cases, cable with a smaller diameter is chosen because it’s less challenging to run. “Fine” is relative. Sure, the VHF radio, GPS, or AIS works with the higher-loss coaxial cable, but how well? If you fail to make contact with your VHF radio, if an AIS signal from a distant vessel isn’t received, or if you can’t get a GPS lock, the culprit could be your coaxial cable. Now you’ll know what to do about it. Steve owns and operates Steve D’Antonio Marine Consulting (www.stevedmarine.com), providing consulting services to boat buyers, owners, and the marine industry.